They say home is where the heart is. But home can take on a lot of different meanings: where you grew up, where you went to school, where you currently live or just a favorite place. It’s hard to walk down the street without passing someone wearing a hat or shirt featuring a sports team, college or a place they’ve visited. You’ve seen them all, the baseball caps, the embroidered golf shirts, and the silk-screen tees. 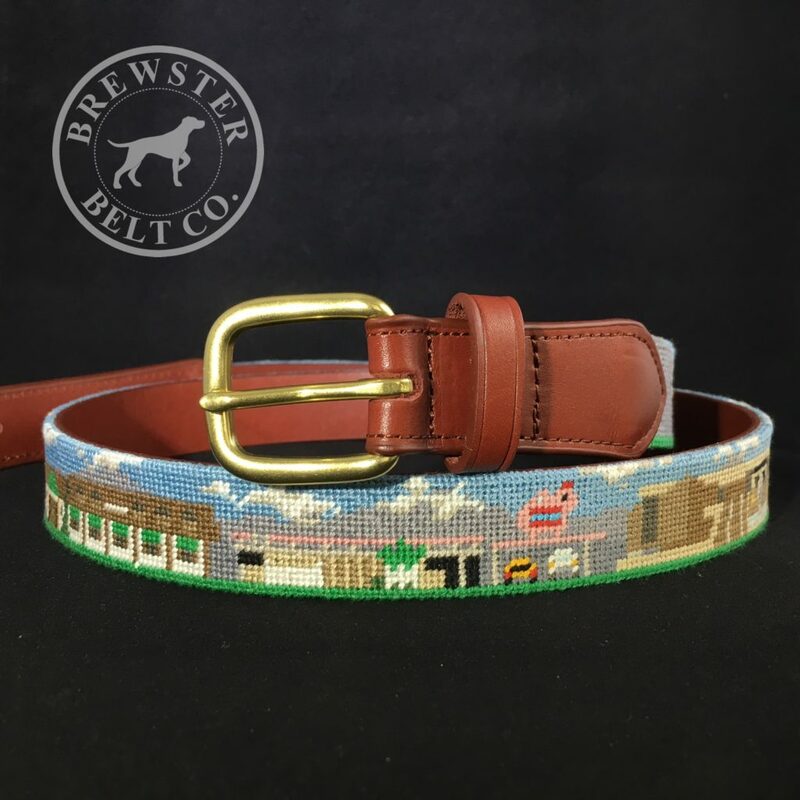 One thing you probably haven’t seen is Brewster Belt Company’s custom city needlepoint belts. Brewster’s city needlepoint belts feature intricately hand-stitched landscapes and landmarks. 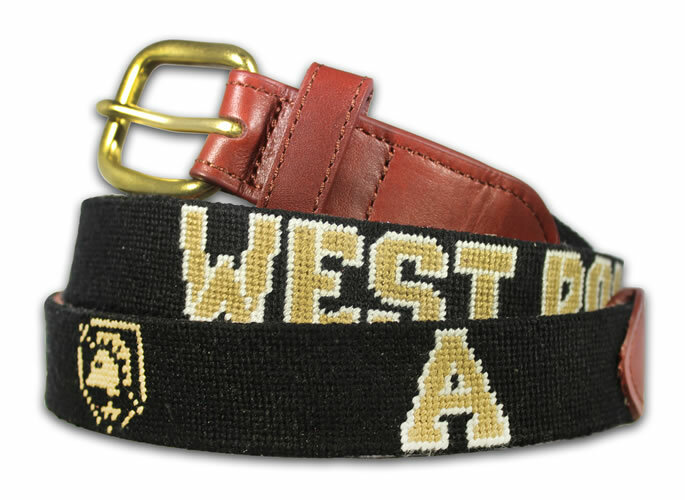 The high-quality custom needlepoint belts are backed in real leather and feature solid metal buckles. These city needlepoint belts offer a classy and unique way for individuals to express themselves and show their love for a place that holds meaning for them. Whether you get one for yourself or give one as a gift, Brewster Belt Company’s custom, needlepoint belts are frequently a conversation starter. Brewster Belt Company is always creating new needlepoint designs. Below are some of the most recent city needlepoint belts available at www.brewsterbelt.com including Philadelphia, Avalon (NJ), Nashville and New Orleans. This Philadelphia Needlepoint Belt will make you want to eat a cheesesteak, hum the Rocky theme song and ring the Liberty Bell. It features key landmarks from the “City of Brotherly Love” including Citizens Bank Park, the Philadelphia Art Museum, The Rocky Statue, the Liberty Bell, the LOVE Sculpture, Boathouse Row, Betsy Ross House, Independence Hall and Lincoln Financial Field. If you’re looking for a unique gift for someone who loves Philadelphia, look no further. 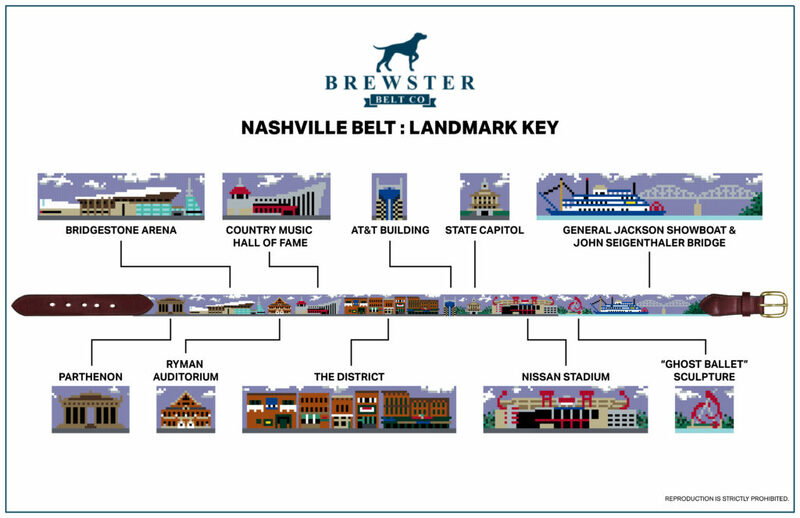 The Nashville Needlepoint Belt features famous landmarks from the “Music City.” Nashville’s downtown area is packed full of energy with a diverse assortment of iconic music venues, architectural and cultural attractions. This needlepoint belt includes images of: The Parthenon, Bridgestone Arena, Ryman Auditorium, Country Music Hall of Fame, The District, Bell South Tower, Tennessee State Capitol, Nissan Stadium, Ghost Ballet Sculpture, General Jackson Showboat, and the John Seigenthaler Pedestrian Bridge. 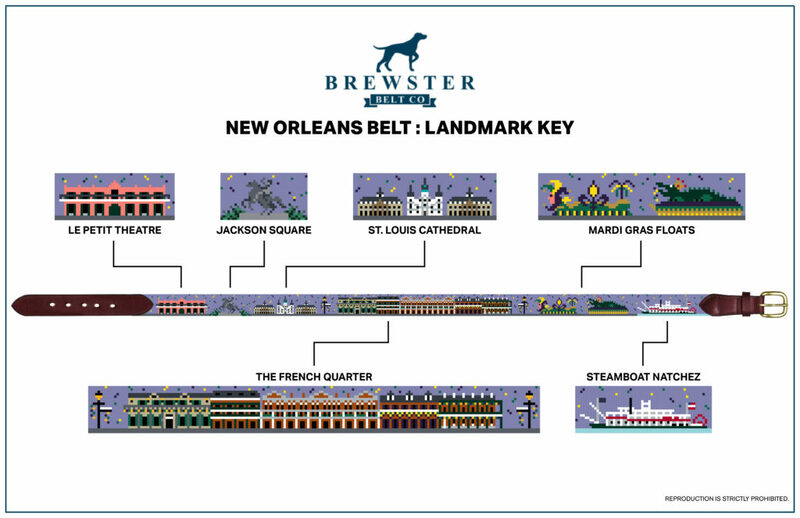 Brewster’s New Orleans Needlepoint Belt is a unique gift idea for a guy who loves “The Big Easy.” New Orleans is a beautifully blended melting pot of French, African and American cultures complete with a vibrant music scene, a culture rich in history and some very spicy cuisine. This New Orleans needlepoint belt offers a panoramic view of the city including images of: Le Petit Theatre, the statue of Andrew Jackson, the Cabildo, Bourbon Street, Jester Float, Alligator Float, and the Steamboat Natchez. 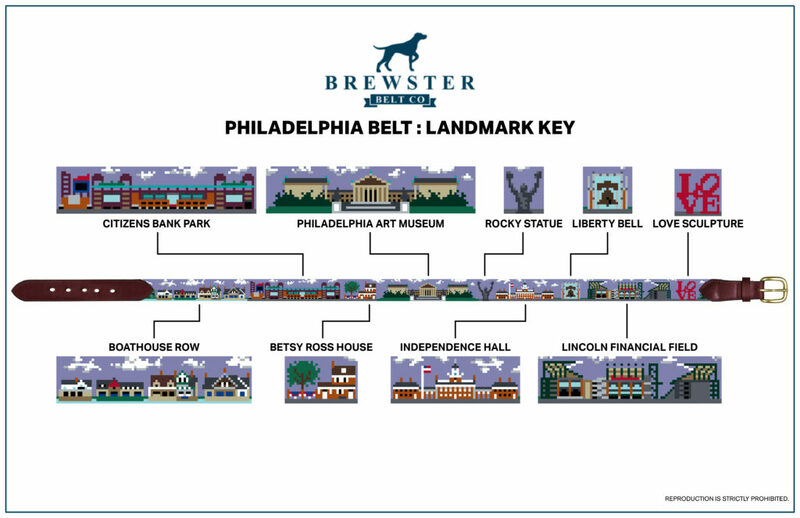 The Brewster Belt Company website features dozens of city landscape belts, as well as other unique needlepoint belt designs. Brewster also sells custom needlepoint wallets, flasks, key fobs and more. 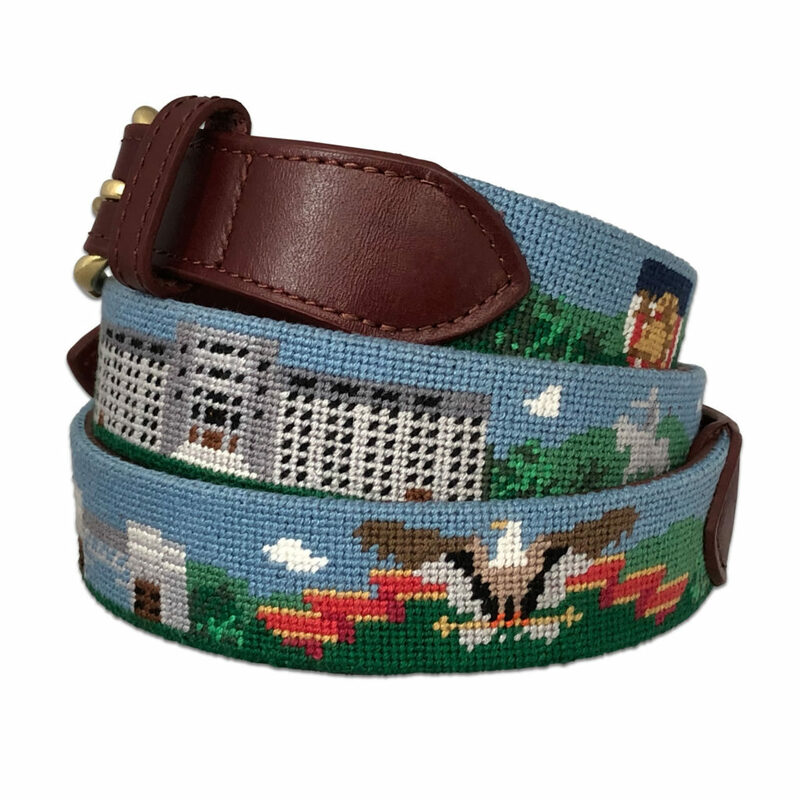 Brewster regularly posts new needlepoint designs on their website, but if you don’t see what you’re looking for, you can create your own custom needlepoint belt at www.brewsterbelt.com. It’s that time of year when more than 11,000 rowers from all over the world travel to Cambridge, Massachusetts to compete in the world’s largest rowing event: the historic Head of the Charles Regatta. This year, the Head of the Charles takes places October 21-22, 2017. Tens of thousands of spectators will cheer on the athletes along the Charles River from Boston University to Harvard University to watch rowers compete in 55 different race events. 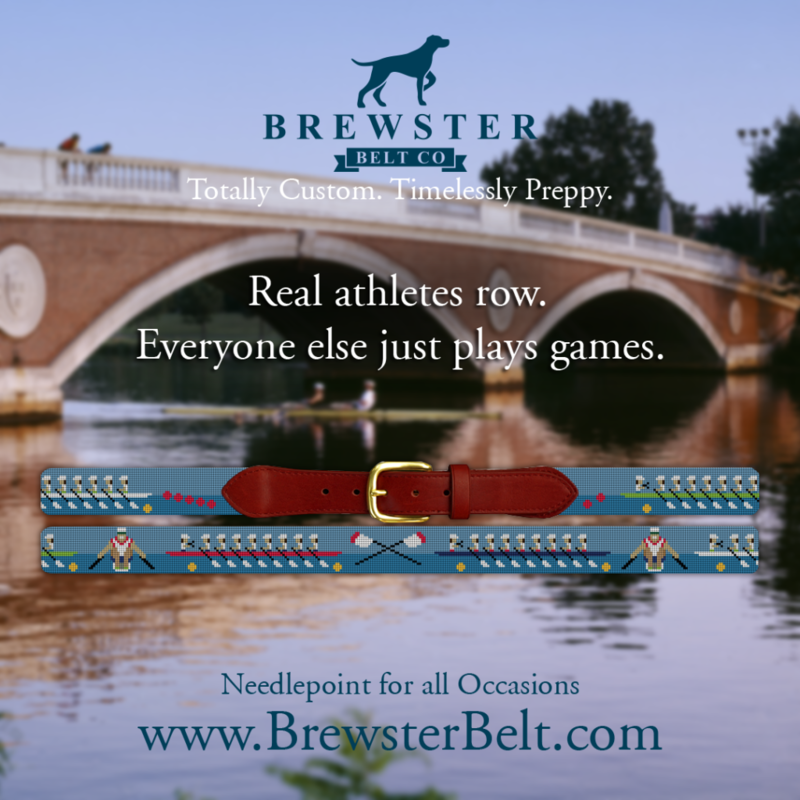 Rowers and spectators alike can show their love for rowing with a Crew Needlepoint Belt from Brewster Belt Company. Since each belt is custom-made, it can be personalized with initials, the year, custom shell or oar colors, etc. The city of Boston…and Cambridge, of course, has a long history of rowing that dates back to mid-1800s including historic races such as the Harvard-Yale Regatta (a.k.a. “The Race”) and the Head of the Charles. Boston also boasts the third oldest rowing club in the U.S. The Union Boat Club was founded in 1851 and is the longest continuously operating rowing club in Boston. Brewster Belt Company’s Boston Landscape Needlepoint Belt captures some of the city’s iconic landmarks and makes a great gift for those who love Beantown. 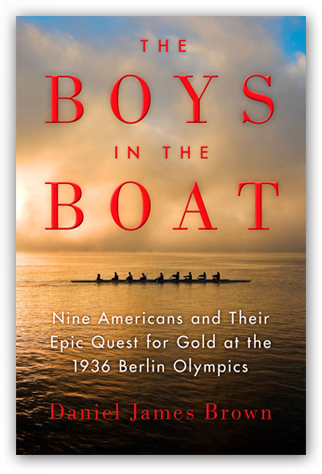 This book about an historic crew team, would make a great gift paired with a needlepoint crew belt. Rowing is credited as the oldest intercollegiate sport in the United States. Colleges from coast to coast have participated in races and regattas since the mid-1800s. Collegiate rowing athletes and fans can show pride for their team with a custom campus landscape belt featuring their favorite college such as the Princeton University needlepoint belt below. Brewster Belt Company wishes all rowing competitors the best of luck! And remember, whatever your favorite sport, hobby, city, college or whatever is….whatever your “thing” is…there’s a belt for that. Check out all the designs at www.brewsterbelt.com or work with our designers to create your own custom design. On Monday, August 21, 2017 Americans in 14 states from, Oregon to South Carolina, will experience a total eclipse of the sun. The moon will completely cover the sun as as it makes its way around the Earth that day (at least from our perspective). Each location along the “path of totality” will be able to see the total solar eclipse for approximately two minutes and forty seconds. Those outside of the path will see a partial eclipse. The further away you are from the path of totality, the smaller the percentage of the sun that will be covered. Of course, if you turn on your TV, you will be able to watch the eclipse live from several locations across the United States and you won’t even need protective glasses. Personalize this solar system belt with your initials or “2017” to commemorate this year’s solar eclipse. The continental United States has not witnessed a total solar eclipse in 38 years, so many people will be seeing the first solar eclipse of their lifetime, which is why there is so much excitement around the event. If you’re a solar system or space buff, check out Brewster Belt Company’s Solar System Needlepoint Belt featuring the planets and….If you look closely, you can see the solar eclipse on the belt. For an added touch, this belt can be personalized with initials or the year “2017” (to commemorate the eclipse). Whether you live in Oregon or are traveling there to be among the first Americans to view the total solar eclipse, commemorate the event with an Oregon Flag Needlepoint Belt or an Oregon Flag Needlepoint Dog Collar for your furry friends. To mark the occasion, add a “2017” monogram to the belt or dog collar. The 2017 Total Solar Eclipse path of totality in the U.S. will end in the state of South Carolina. 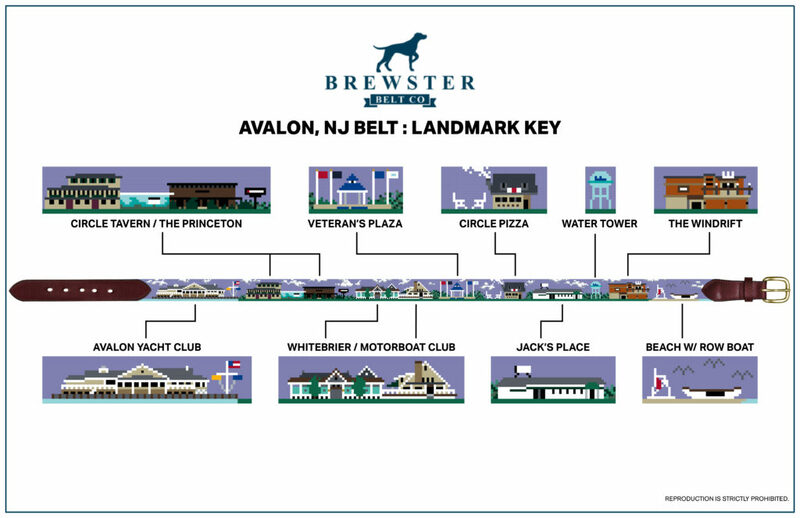 And, in case you were wondering, Brewster Belt Company also has a belt for that….and a wallet…and a dog collar. Check out all of the South Carolina needlepoint accessories here. If you’re disappointed that you’re not in the path of totality for the 2017 Great American Solar Eclipse, there is another solar eclipse coming to North America in 2024. The path of totality for the eclipse in 2024 will stretch from Texas to Maine. If you’re looking forward to the 2024 Total Eclipse, the path of totality in the U.S. will kick off in the Great State of Texas. Get ready for the big day with a Texas Flag Needlepoint Belt or a Texas State Needlepoint Belt or a Texas Dog Collar. Enjoy the total solar eclipse and don’t forget to use your viewing glasses! It can be hard to find a gift for the guy who has everything….and even harder to find a meaningful gift. So, I was thrilled when I found out about Brewster Belt Company when I needed another gift for my grandfather. He’s now close to eighty years old and over the years, I’ve exhausted my arsenal of personalized gift ideas for him having purchased everything from custom golf balls to monogrammed handkerchiefs for Christmases, birthdays and Father’s Days. With another Father’s Day approaching, I was racking my brain for a unique gift idea that he would actually use when a friend told me about Brewster Belt Company’s custom needlepoint belts. 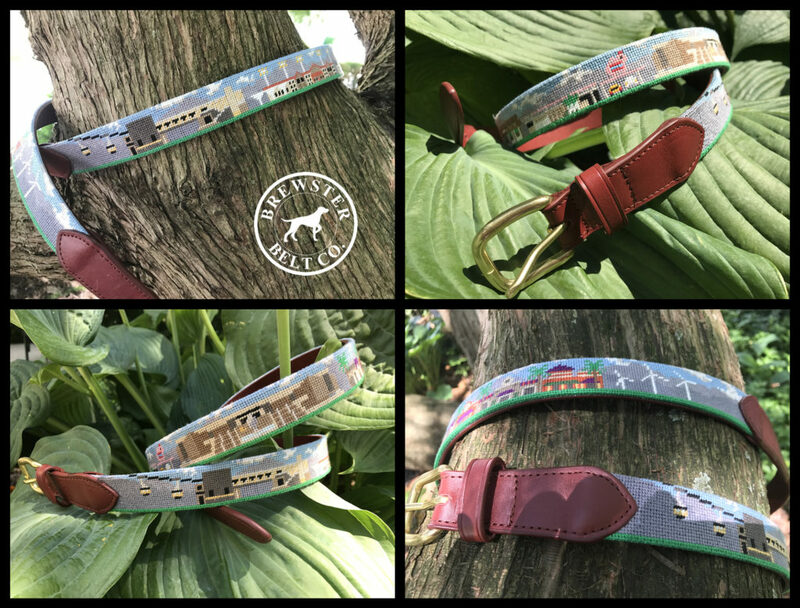 When I saw the custom landscape needlepoint belts, I knew I had found the perfect gift and I knew just what landscape design I wanted on the belt…. A custom, landscape belt of a favorite place (like this Palm Desert Needlepoint Belt) makes a great gift for the person who has everything. My grandparents have been “snow birds” in Palm Desert since the 1970s. Growing up, we usually visited annually. In the depth of winter, we would board a plane from Chicago’s frozen O’Hare airport where we were transported to the sunny, outdoor Palm Desert Airport. As a child, I remember looking out the plane window at the vast desert as we approached the airport through the mountains. As we flew by the residential areas with a bird’s eye view, the terra cotta roofs, golf courses and swimming pools looked like a dollhouse scene. In the early days, you exited the plane via stairs in the open air. The blinding sunshine and dry, floral smell of the air were always a welcome greeting. 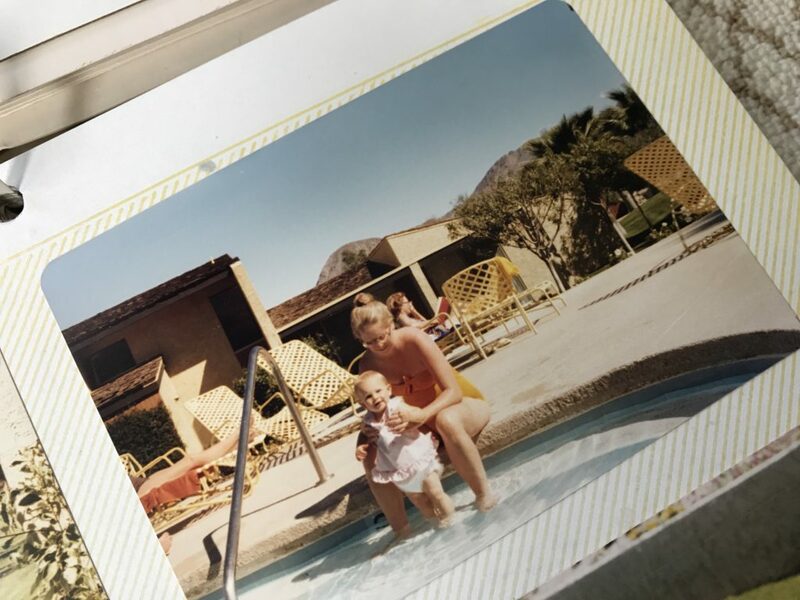 We spent our time in Palm Desert basking in (and burning in) the eternal sunshine and keeping cool in the pool surrounded by flowers, palm trees, clear blue skies and mountains. We visited the Living Desert Zoo and shopped and dined on El Paseo. I rode alongside my grandfather as he drove his classic Jaguar to the Pink Elephant car wash and I still remember the elephant-shaped receipts he collected in the center console to earn free car washes. 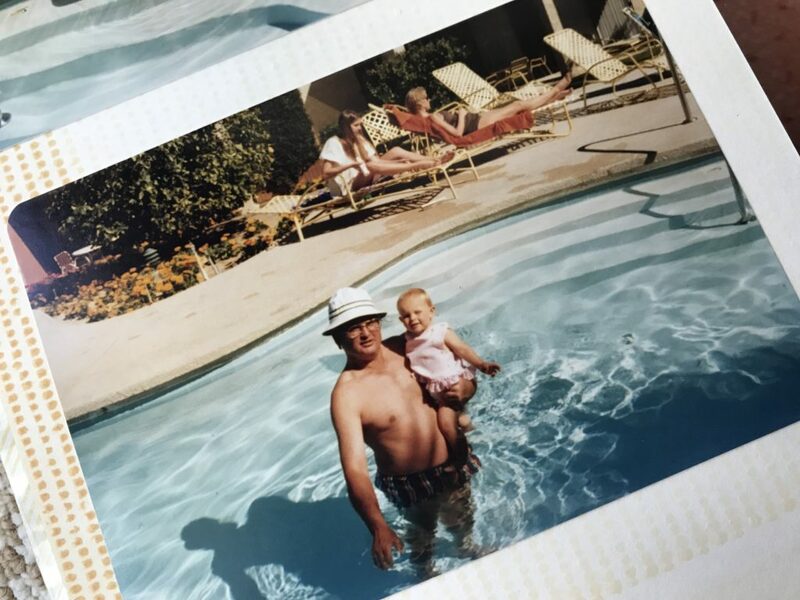 As we grew up, we started going to the big tennis tournament at Indian Wells and one night, he took my husband and I to “The Nest,” an iconic piano bar that has been a popular haunt for the young and old since 1965. 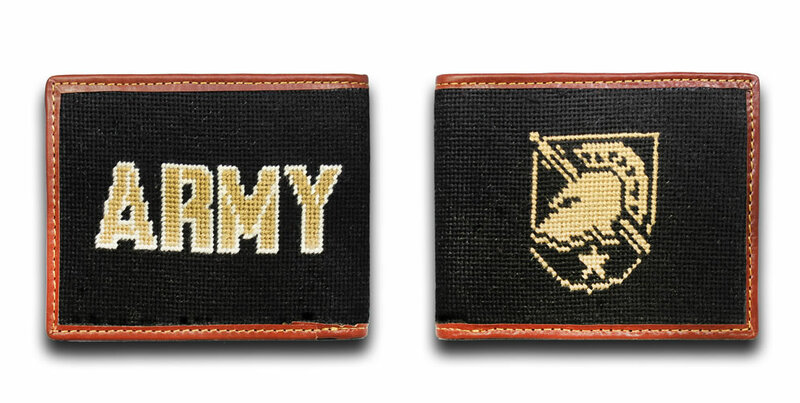 So, the next time you find yourself searching the end of the Internet for a personalized gift idea for a husband, dad, grandfather or friend in your life, consider a custom needlepoint gift from Brewster Belt Company and turn their memories into a meaningful, custom gift. In addition to belts, Brewster also offers custom wallets, flasks, dog collars and wedding gifts. Browse the website at www.brewsterbelt.com for design ideas or create your own custom design. Check out some city/landmark belts here: https://brewsterbelt.com/belts/cities-and-landscapes/. When the 4th of July rolls around, it finally feels like summer and yet it also feels like summer is halfway over. From festive BBQs to booming fireworks, the 4th of July is a holiday that Americans love to celebrate. It’s also a holiday that Americans love to dress up for: American flags, stars, stripes and red, white and blue dominate 4th of July attire. 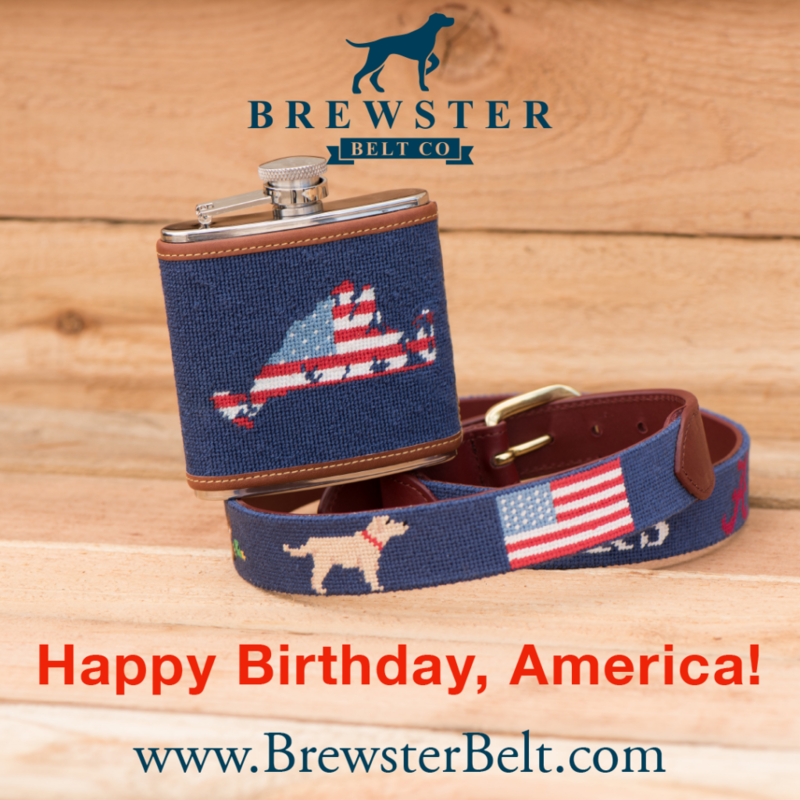 Generally, 4th of July attire only sees the light of day once a year, but Brewster Belt Company has American-themed needlepoint accessories such a belts, wallets and flasks that you can use for 4th of July and all summer long. And, don’t let your four-legged friends miss out on all the fun; Brewster has custom, needlepoint dog collars that dogs and humans are sure to love such as the American Flag dog collar below, which can be customized with a name, owner’s phone number and more. From sea to shining sea, Brewster offers hand-stitched needlepoint belts with an American flag design worked into the shape of an island or state, such the Nantucket Island American Flag Needlepoint Belt below, a classic look that works for 4th of July and all summer long. American flag designs are available for any state or island and all belts and dog collars can be customized with a monogram. Thread colors, buckle metal color and leather accent color can also be modified to fit your preferences. Below is a State of Virginia American Flag Needlepoint Belt on a grey background. Your Benjamins also deserve a comfy and stylish place to lay their heads, so check out the American Flag Needlepoint Wallet below. Stash your cash, cards and ID in style with this flexible, hand-stitched needlepoint wallet with leather accents. 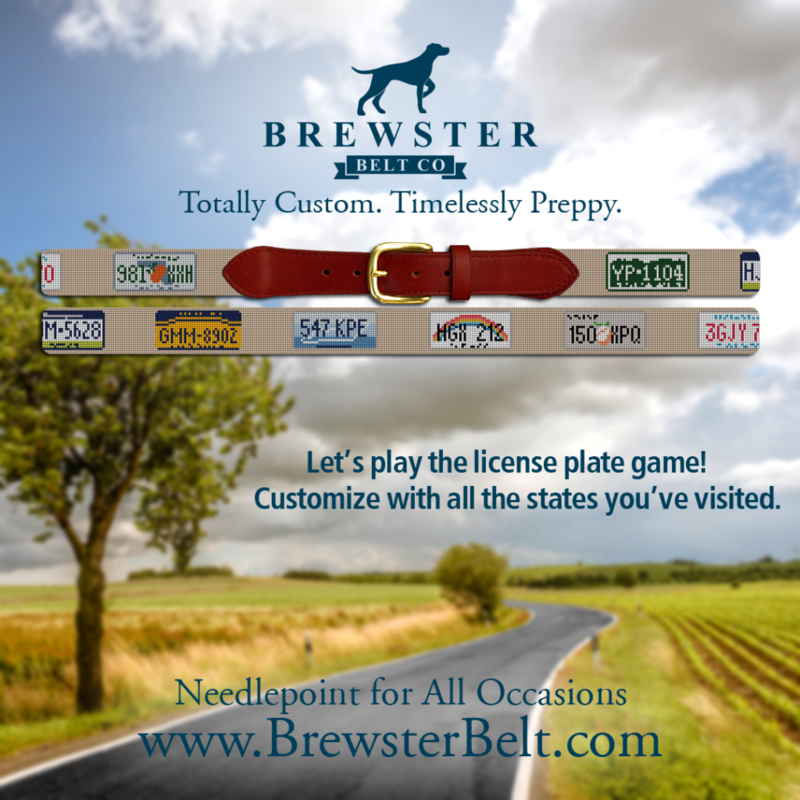 Like everything Brewster Belt Company makes, it’s made-to-order and customizable. For those who are feeling particularly patriotic, Brewster’s Fourth of July American Flag Needlepoint Belt makes a bold statement. Featuring flags, stars, stripes, plaid and a red/white/blue motif, this 4th of July needlepoint belt design has it all. 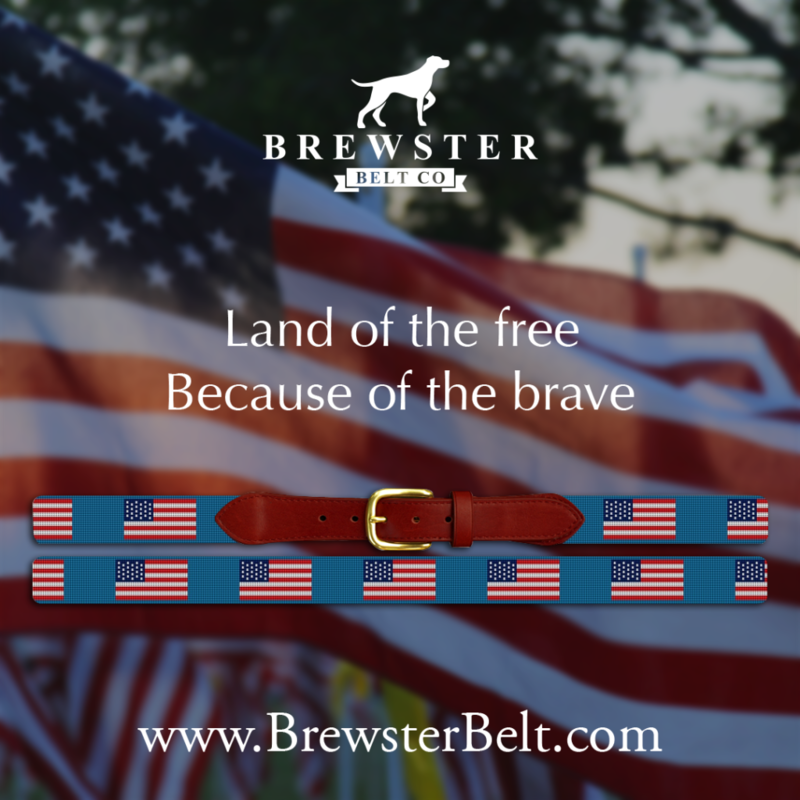 Brewster Belt Company wishes you a fun and safe 4th of July holiday weekend. It’s never too early to order gifts for your friends, family or even yourself. 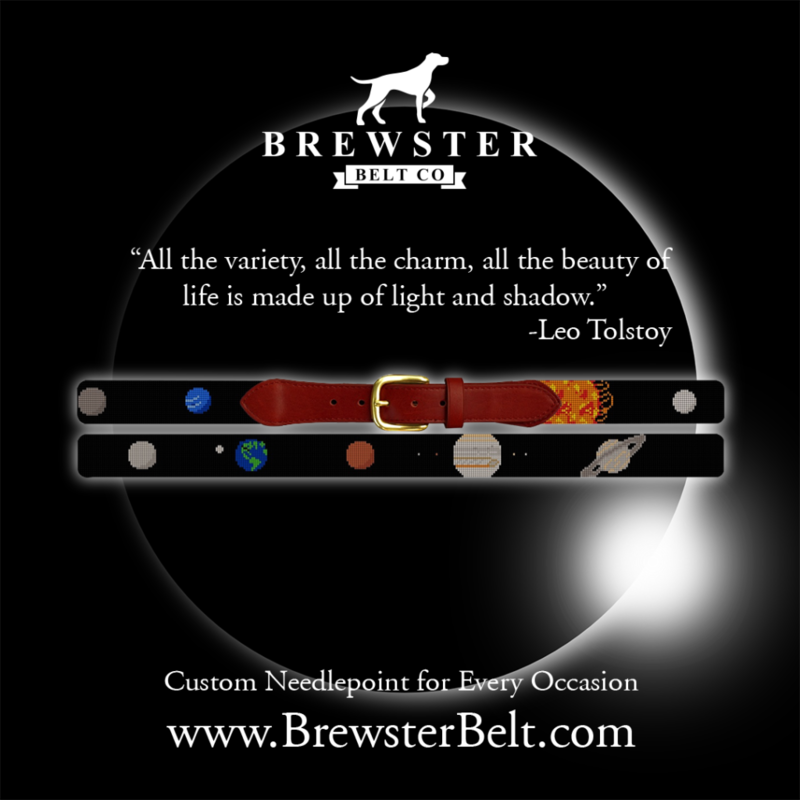 Browse hundreds of designs at www.brewsterbelt.com or create your own custom design by contacting the designers at Brewster Belt who will help you make your design idea come to life. According to research, spending money on experiences such as traveling, visiting museums and doing outdoor activities makes people happy. The experiences, researchers say, become part of your memory and identity. In addition, they say that talking about your experiences with other people and recalling those fond memories further enhances your happiness. So, get out there this summer and make some memories! Summer in Chicago is the best! Show your love for the Windy City with this Chicago Landscape Needlepoint Belt. When you return from your travels all happy and glowing, Brewster Belt Company’s city and landscape needlepoint belts can help you and your friends and family preserve those memories. The custom, hand-stitched needlepoint belts feature landmarks, landscapes and scenes from all your favorite places and make a great gift. The belts are so unique and detailed that they make a great conversation starter, so you can share your travel memories and fun experiences with others all year round. Below is a sampling of some of the fantastic location and landscape designs that Brewster Belt Company has created for clients this year. If you love vacationing on Cape Cod or need a gift for someone who loves the Cape, a Cape Cod needlepoint landscape belt features iconic scenes and landmarks including Canal Bridge, Woods Hole Marine Biological Lab, Hyannis Lighthouse, Well Fleet Harbor with fishing boat, Chatham Windmill, Chatham Lighthouse, Rail Bike Path, Providence Pilgrim Monument, Race Point Lighthouse and sand dunes. Heading to the Cape this summer? Looking for a classic Cape Cod gift? With this classic, hand-stitched needlepoint Nantucket belt around your waist, you have our permission to use “summer” as a verb. Nantucket style is clean, classic, preppy and timeless. Whether you’re a resident or a visitor, this belt is sure to complement anything you wear on Nantucket and beyond. A Brewster Belt Company client recently created this custom, needlepoint Palm Desert belt as a Father’s Day gift for her grandfather who has spent his winters in Palm Desert since the ’70s. She made sure to include an image of the Pink Elephant Car Wash where her grandfather used to have his classic Jaguar washed and the ever growing tennis complex where they watched many battles between Federer and Nadal surrounded by the desert and gorgeous mountains. Her grandfather loved all the memories included on his belt. For those who love the mountains, hiking and the great outdoors, this mountain hiking needlepoint belt can preserve their mountain memories whether they are hiking an urban jungle or a mountain trail. All belts are custom-made, so you can change any aspect of the design including changing the leather and buckle color. Consider adding a monogram for further personalization for your favorite outdoorsman. A Needlepoint Belt for Those Who Love the Great Outdoors…. If you’re looking for a Martha’s Vineyard gift idea for someone who loves going to the Vineyard, Brewster’s Martha’s Vineyard Needlepoint belt is a gift they will cherish for years to come. The detailed belt features a landscape including iconic landmarks such as Gay Head Cliffs, Gay Head Lighthouse, Larsen’s Fish Market, Grange Hall, Black Dog Tavern, Flying Horses Carousel, Edgartown Yacht Club, East Chop Lighthouse and the ferry. The Big Apple is a popular travel destination all year long. Brewster’s New York City needlepoint belt features several iconic city landmarks including the Statue of Liberty, Freedom Tower, Brooklyn Bridge, Wall Street, the High Line, MSG, a subway entrance, a New York City taxi, Guggenheim Museum, Chrysler Building, Washington Square Park, Times Square and the Empire State Building. This New York City belt makes a great gift for anyone who loves The Big Apple. No matter where you travel this summer…whether it’s to your local pool or abroad, you can create a memorable needlepoint gift full of travel memories. In addition to detailed city and landscape belts, Brewster Belt Company also has state flag and state image belts for all 50 U.S. states. Check out the website for needlepoint belt design ideas or create your own custom design. It can be hard to find a personalized Father’s Day gift idea that’s both personal and practical, but Brewster Belt Company has you covered with its hand-stitched, needlepoint belts, flasks and wallets. Browse the existing designs or create your own custom Father’s Day gift. Personalize any design with a monogram to make a truly one-of-a-kind Father’s Day gift. No matter what your father’s/grandfather’s/husband’s favorite hobby is, you can create a personalized gift that he can cherish for years to come. 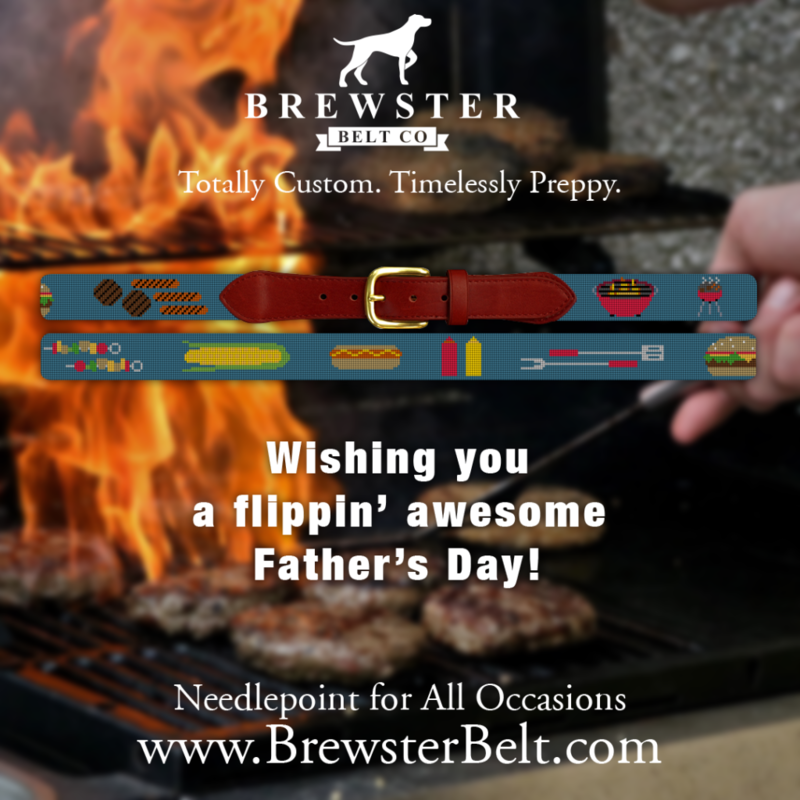 Even if you’re shopping close to Father’s Day and your custom gift is still being stitched, Brewster Belt Company can provide you with a preview card that can be given to the lucky Dad, so he can see an image of the fantastic Father’s Day gift that is coming his way. Below are some design ideas to help you find the perfect Father’s Day gift…. If sports are his thing, Brewster’s got his game. From baseball to basketball to….croquet (does that count as a sport? ), there’s a needlepoint sports belt for that…and a wallet…and a flask. Whether he loves fly fishing, deep-sea fishing or freshwater fishing, Brewster has custom needlepoint fishing belts for dad who love to fish….wallets and flasks too. Whether Dad likes hunting ducks, turkeys, big game, quails or even boars, Brewster has a needlepoint hunting belt design for that. For the dad who loves sailing, a custom maritime signal flag belt is the perfect accessory. Each flag stands for a letter of the alphabet, so you can customize your belt with your dad’s full name, a vessel name, or a fun saying. If dad is a fan of the America’s Cup race, he might enjoy this needlepoint belt featuring seven of the early America’s Cup winning yachts. Be sure to check out the other sailing designs as well. Whatever his musical taste or favorite instruments, you can design a custom, needlepoint music belt. How about a needlepoint belt with a piano key design or musical notes or even images depicting his favorite song? If you can imagine it, Brewster Belt can help you design it. Let your dad know you appreciate his humor by getting him a Father’s Day gift that’s a little tongue-in-cheek such as an emogi belt, a flamingo belt or an irreverent flask. Even if you have to provide the tech support, at least Dad has a smart phone. And if he’s still using a flip phone, then maybe this needlepoint app belt will help him a hint. All Brewster Belt Company needlepoint belts and accessories are made-to-order, so you can customize them any way you like. Whether you choose an existing design from the website or design your own custom needlepoint belt or accessory, our designers will help you create the perfect gift. If you’re ordering after the Father’s Day deadline, we can provide a gift preview card that can be given to the recipient, so he can see an image of the fantastic gift that’s coming his way. Gift certificates are also available. Often “celebrated” as the holiday that kicks off the beginning of summer, Memorial Day has a much more meaningful origin. It was established as a somber day of remembrance for those who died in service to the United States. Originally called “Decoration Day,” the holiday was borne out of the Civil War; however, it was intended to recognize the sacrifice of all Americans who died serving the United States, regardless of the particular battle. Traditional protocols for observing Memorial Day include raising the U.S. flag briskly to the top of the staff and then solemnly lowering it to half-staff, where it remains until noon. At noon, it is raised to full-staff for the remainder of the day. The half-staff position is in remembrance of the more than one million men and women who have given their lives in service of their country. At noon, their memory is raised by the living, who resolve not to let their sacrifice be in vain, but to rise up in their stead and continue the fight for liberty and justice for all. Other traditional observances include wearing red poppies, visiting cemeteries and placing flags or flowers on the graves of the fallen heroes and visiting memorials. This Memorial Day weekend, as we spend time with family and friends, let’s take some time to thank and remember those who gave the ultimate sacrifice for our country and our freedom. If you’re wondering what to wear to the Kentucky Derby, Brewster Belt has you covered with fashion tips and unique Derby needlepoint belts. The Kentucky Derby is a great opportunity for men to go all out with their attire from bright colors to bold prints to preppy accessories. Whether you’re attending the actual Derby at Churchill Downs or heading to a friend’s Kentucky Derby party, Derby spectators love showcasing unique and preppy spring fashion. Bright colors and pastels are always in style at the Derby. You may want to start coordinating your outfit by selecting a pair of pants first. While traditional khaki and navy is always in style, considering stepping out of your comfort zone with colored pants: pink, yellow, green…you’re likely to see it all. Bold-colored pants pair nicely with traditional shirts and blazers. Or, go neutral with your pants and bring in some color with your blazer or accessories. Brewster Belt Company’s needlepoint belts can be fully customized, so name your color. Consider sporting some fun and preppy prints such as seersucker, plaid, gingham, stripes and other bold prints. Mix and match one or two prints for a contemporary look. Pants and jackets with embroidered horses, julep cups, and horseshoe designs can show people you’re serious about fun. You can also bring in prints with a preppy needlepoint belt. Add a monogram to your belt to further personalized it. When it comes to Kentucky Derby fashion, it’s okay to go a little over the top. Say yes to a necktie or bow tie. Even if you’re wearing shorts, a bow tie can dress up your outfit and make you look that much more original. Match your bow tie with your pocket square and/or hat for a complete and coordinated look. Or, wear your bow tie on your belt for a more casual look. Focus on the details by adding a monogram. The women don’t get to have all the fun with hats; men can wear them too. Men’s Derby hats are usually a solid color and inspired by the style from the 1920s such as a fedora or bowler hat. You can also add some fun and humor to your look with your socks and belt. 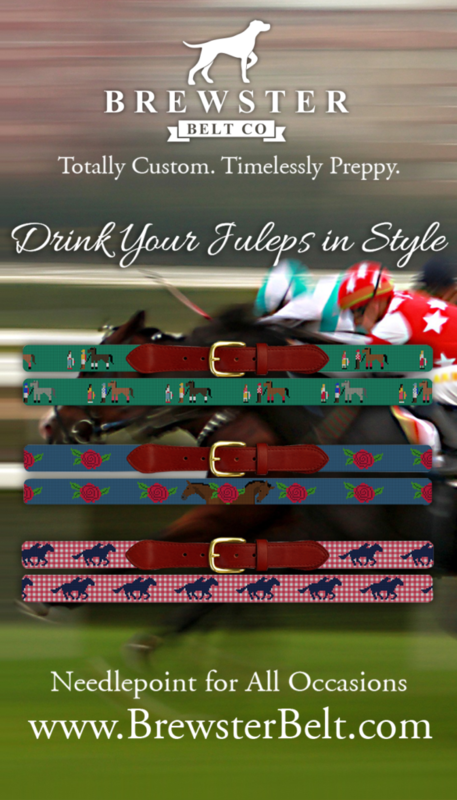 Whether you go classic or eye-catching, a Derby needlepoint belt will complete any Kentucky Derby outfit. Brewster Belt Company offers an unlimited selection of custom, needlepoint belts and accessories. Create your own design or browse our designs at www.brewsterbelt.com.